You and your child(ren) will be supported by a social worker as you get to know each other, start living together and become a family. Initially you will spend time with your child in the foster carer’s home getting to know the child in an environment that is comfortable for the child. You will have the opportunity to learn from the foster carer the routines that the child is familiar with and as you begin to build your relationship you may take the child out, perhaps to a local park. Depending on the child’s age you may meet nursery teachers or school teachers and learn how your child copes in group settings. If there is special support required to help a child in school then it will be important that these supports are replicated when the child moves. These meetings will be built up over a week or two and at a pace that is right for the child and for you. You will be involved in the child’s mealtimes and bedtimes as you begin to take over some of the child’s care. The child will visit your home, initially together with their foster carer or social worker, and soon you and the child will feel confident of enjoying time together. After a series of visits you are ready for the child to move in with you. Before this happens you will have a final planning meeting, where you meet with your social worker, the child’s social worker, their foster parents and anyone else with significant involvement in the child’s care. At this meeting you will discuss the coming move and agree the details. This plan outlines all the support you will receive and when reviews of the placement will take place. The plan is there to make sure that you and the child feel supported as you go through this huge adjustment. Once everything is agreed, the child comes to live with you. The arrival of a new child is a time of significant change for your whole family. Your adoption agency and the child’s social worker will be available to support you, and you will be eligible to take statutory adoption leave and pay (unless you are self-employed). This means you can take time to get to know your child and build the rhythms of family life. Most adoption agencies request that adoptive parents, or one if a couple, spend a minimum of six months at home when a child is first placed, depending on their age, in order to help you to get to know each other. This enables you to begin to build a trusting relationship with your child and doing things together encourages emotional bonds to develop. The early weeks and months of family life can be both exciting and exhausting as you all get to know each other. Your social worker will visit regularly to support you and it will be important that your family and friends understand that a child will need time with you before meeting too many unfamiliar visitors. To begin with a child may be struggling with the loss of their familiar foster carers and have little belief that they will be staying permanently with you. It will be important not to overwhelm your child with visitors in the early weeks as he/she is adjusting to a new family. One way of helping your family and friends to understand and support you during this time is to talk with them about the task you are managing. 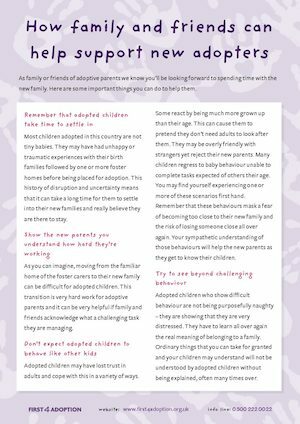 You may find it helpful to share this guide, ‘How family and friends can help support new adopters’ which carefully explains a child’s possible behaviour because of moves in their earlier lives, and how as family and friends they can support you and your child to build a trusting relationship. During these early months before you have legally adopted your child you will have joint parental responsibility with the child’s adoption agency and the child’s birth parents, although the balance of parental responsibility will vary depending on each individual case. There will be regular reviews in your home with an independent reviewing officer, together with you, your social worker and the child’s social worker to discuss how the child is settling. Your child’s social worker will continue to meet with your child to help him/her cope with the many adjustments they are facing. The post-placement support was better than you could imagine; we found it the most valuable part of the whole process. If your child is of school age you will have found the most suitable school by visiting schools in your area and deciding which would be most sympathetic and supportive for your child. You may want to consider a gradual introduction to school over a week or two and to be sure that the school know of any additional educational support your child may need. You will be able to register the child with your GP for medical treatment, but for any serious condition you would need the consent of the child’s local authority for medical treatment, particularly if an anaesthetic is required. Part of sharing parental responsibility with the local authority is letting the adoption agency know if you are taking a holiday with your child and making sure that the agency knows your address and contact details. You would also need the agency’s written consent to take the child abroad as a passport will be in the child’s birth name. However, as your child is settling into your family, the regular routines of daily life are important to help build a sense of predictability after so many changes. For this reason holidays may create a lot of anxiety and are best left until your child is feeling more secure in the family. During this period of learning to live together a social worker will continue to support you and your child until the Adoption Order is granted. It is the adopter who makes the adoption application to the court when the time feels right, usually with the support of the child’s adoption agency. You need to feel ready to take on the full parental responsibility for the child. The minimum period before applying for an Adoption Order is 10 weeks, but many families are helped by a longer period of adjustment and value the continued support of social workers during this time. Now I am a parent my only gripe is being referred to as an ‘adoptive mother’. As far as I’m concerned I am my child’s mother, full stop, although we both now know that he has two mummies. My son is far and away the best thing that has happened to me and adopting is the best thing I’ve ever done. Details of any earlier court hearing that recommended that your child should be placed for adoption. Details of any contact agreements with birth family members either indirect or direct. any ongoing support agreements such as financial or therapeutic to support your child . Your child does not attend the Adoption Hearing. However, once the Adoption Order is granted, you will have the opportunity to bring your child to a Celebration gathering at the court to meet the judge or magistrate who made the Adoption Order. Photographs can be taken and this is a significant day to remember with your child in future years as you talk about his/her adoption story. Once the Adoption Order is granted the child is legally adopted by you and you have full parental responsibility for him or her. The child is now a full member of your family and can take your surname. Some adopters like to add a forename also. Adoption Certificates replace the child’s birth certificates and are in the child’s new adoptive name. 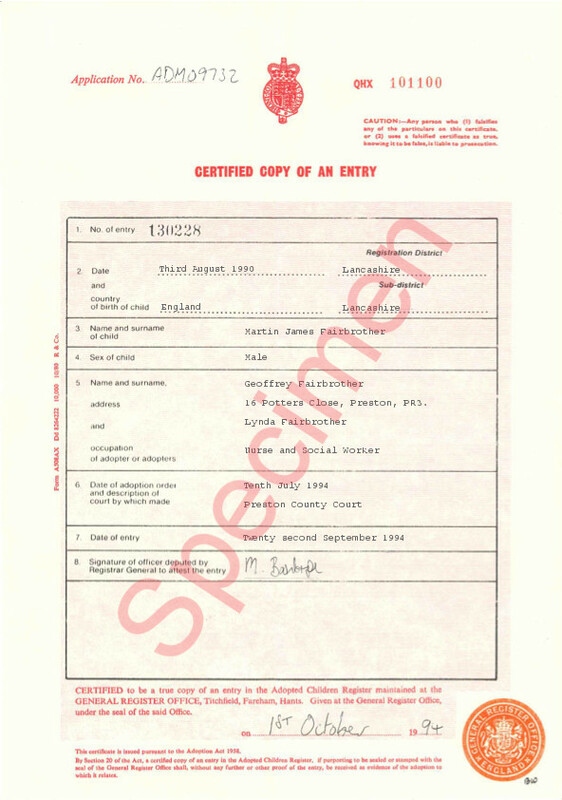 As you can see in this example the long adoption certificate gives details of the adoption and is necessary for formal identity such as a passport. You will receive post-adoption support from your agency but every family’s needs are unique and support is tailored accordingly. In addition there are voluntary organisations that are there to provide additional support at all stages of your journey. Our adoption support section has more information and you can also find support providers serving your area.